Our newest club is a one-of-a-kind club where you get to sample some of our most luxurious yarn bases in the colors you choose. Each shipment will include enough yarn for a small project, along with useful color-themed extras and project suggestions. Color groupings mean that all of the yarn you receive will fall in some way into that color family, but we will aim to give you different shades of the same color or even a variegated colorway where that is just one of the main colors. Sign up for one or several, or choose the “full spectrum” option to be totally surprised! What is the sign-up deadline? The last day to sign up for this round of the Spectrum Club is March 15, 2010. We do have a limited number of spots available though, so they may close earlier if we run out of space. When will shipments go out? This round will contain four shipments, which will be shipped to you in May, July, September, and November as close to the beginning of the month as possible. What is the cost for international subscribers? Subscriptions to the US and Canada are $164 for the full round. All other international subscriptions are an extra $10, $174 for the round. Of course – you can sign up for as many or few as you’d like. Maybe you’d like both the red and the green color group, or maybe you want two red subscriptions to make larger projects. Do you offer a shipping discount for multiple subscriptions? We do! For all subscribers, you will receive a refund of $15 per additional subscription if you sign up for more than one. Do club subscriptions count towards the Yarn Marathon? Are the colorways unique to the club? No, all colorways in the club will be standard available colorways so you can get more any time you want. Due to the 11 (!) different color groupings in this club, asking our dyers to create exclusive colorways would have been a near impossible feat, and we’re willing to bet there are some fabulous colors you’ve never tried before. What if I move or need to change my address? If at any point during the club, your shipping address changes, please e-mail us at eatsleepknit@eatsleepknit.com and we will update your information. How much yarn is included in the club? It’s difficult to give exact amounts without giving away some of the surprise, but each shipment will be enough for a small project (this includes accessories, shoulder shawls, socks, etc – basically not sweaters or giant shawls). All but one shipment will contain two skeins. Like everyone else on Ravelry, I had grand plans for the Ravelympics. Four projects – one a sweater, one a WIP that needs to be ripped back and re-knit as the neck is entirely too big even for my giant husband, a pair of mittens, and a hat. I even tacked on a whole other project when the Yarn Harlot announced she would be hosting the separate Knitting Olympics. I know. I know because everyone I have explained my plans to, even my equally fervent knitting friends, has simply laughed at me or, if they are being kind, explained about the laws of physics and that I do have to sleep and run this business from time to time. Gawain was knit in 6 days, ending the day before the Ravelympics, because I went out of town that weekend on a knitting trip and desperately wanted to wear this on the plane. Which I totally did. So I’m going to just admit that I’ve given up on the whole knitting olympics thing, and stick instead to my own personal knitting challenges. 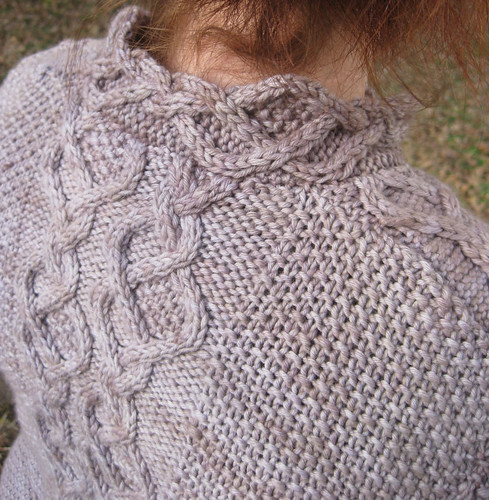 I do really love this sweater, though – the yarn is Malabrigo Twist in the Zinc colorway. 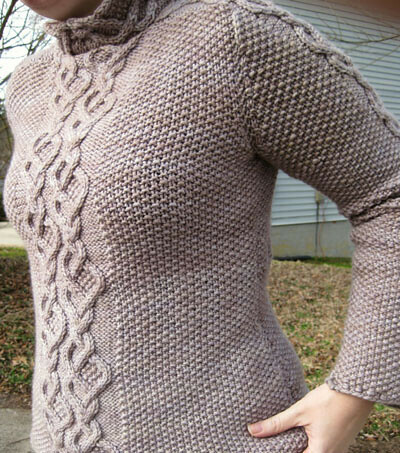 I used every single yard of 7 skeins to knit the 34″ size. (seriously – I ended up scalping the ends from the joins just to seam it) The yarn is so soft and squishy that I kind of want a whole blanket in it, and I barely even minded all the seed stitch. I’ve worn it five times, including twice on the plane coming and going, and it has fuzzed up a bit but no actual pilling thus far and the stitch definition is still quite nice. So color me pleased, anyway.